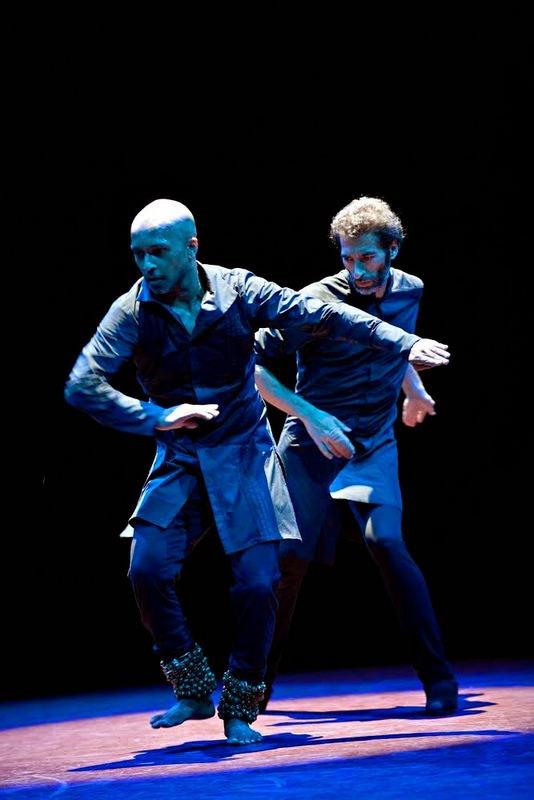 Khan and Galván, photo Jean Louis Fernandez. There is a bull and a cow ('toro' and 'baka' in the title), there is violence and peace, there is flamenco and kathak and there is a bit of Spain and a bit of India in Israel Galván and AkramKhan’ Torobaka that opened the Romaeuropa Festival 2014. Stereotypically Spain is associated with flamenco and bulls as India is with kathak and cows, but this piece is a lot more than that, it is entering a dimension where excellence, irony, intensity, confrontation and rhythm mix in a superb performance. To begin with, Spanish dancer and choreographer Galván’s flamenco is and is not flamenco, it is rather a remarkable style that deconstructs it from the inside, breaking its lines and bringing its percussive nature to an almost airborne level. 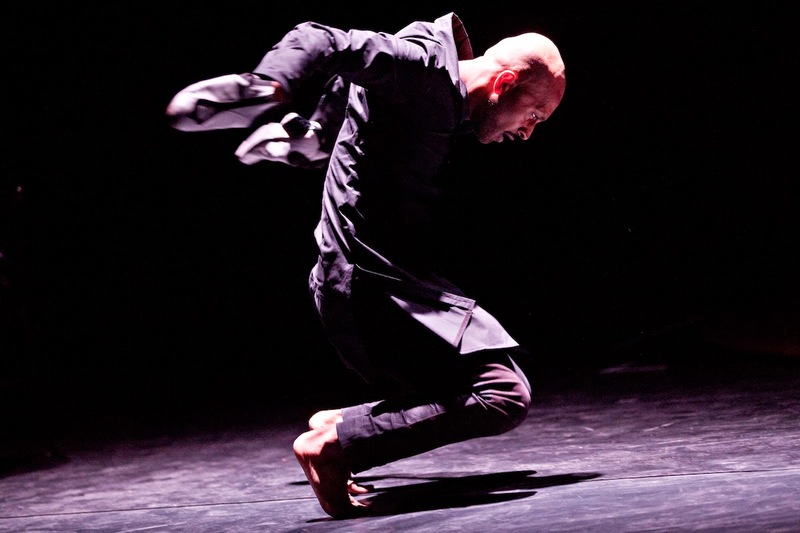 Then, in his thought-provoking choreographic work, Khan’s kathak is reinvented and mingled with contemporary dance, giving a sense of rootedness and three-dimensional quality to the moving body. It goes without saying that the departing images have already been s/mashed and overturned, because Torobaka is about meeting the Other and is also about going beyond that, going beyond symbols and stereotypes to reach the pulsating rhythm we all live in. Shall we call it a duet? Galván and Khan are the two only dancers onstage and they do interact a lot, but the term ‘duet’ only makes sense if we multiply it, if we turn it into a layered series of others that play a fundamental role in the piece: I am referring to the two musicians, Bobote and B. C. Manjunath, the two singers Davide Azurza and Christine Leboutte and to rhythm and sound production. The piece is made of various sections and takes place on a stage which is for most of its part covered by a circular platform surrounded by the musicians and the singers. At the beginning, Galván and Khan are both barefoot and confront each other, exploring space and sound. They both wear the same costume, a tunic that recalls kathak and tight trousers that can be associated with flamenco. Perfect is the ‘dialogue’ between Galván’s feet articulation and Manjunath’s percussion. Azurza, Galván, Leboutte, photo Jean Louis Fernandez. Then Galván puts his flamenco shoes on and performs a solo outside the circle, front-stage right, with a microphone. Again Manjunath is his alter ego, playing with his movements as Galván plays with Manjunath's vocal sounds. Irony is a key feature in Galván’s dancing, irresistible is the moment when he points his finger upwards exclaiming “E.T. phone home”. This is flamenco with a bit of comic relief! When he performs a zapateado (flamenco footwork) inside Khan’s kathak set of bells, we know a change of scenery is going to occur and Khan is going to appear. In the third section, Khan is down to the floor with a pair of flamenco white shoes on his hands. He plays them against the stage floor, against each other alternating their sound with the one produced by his knees and head. It is as if sound ran through his body and could be created by everything he has or is. Instead of Galván’s irony here we have a profound movement density, even when he entertains a ‘dialogue’ with Bobote, who takes the flamenco shoes from his hands, throws them into the wings and starts playing las palmas (flamenco hand clapping) provoking Khan to respond. And Khan sits down on a chair and dances a seated dance. After this, singers and musicians take the stage in a beautiful ensemble. Singers Azurza and Laboutte are phenomenal throughout the whole piece, singing songs from as different traditions as Italy and Spain. On some occasions their chanting seems to slow the dancing down, creating an unusual unbalance, but their bravura is impeccable for the aural background of the two performers. The last section is an explosion of movement, sound and rhythm with Khan particularly in tune with Manjunath’s percussion, Khan's ghungru (ankle bells) reverberating throughout the entire theatre. Rhythm is one key element in this work, a common ground for both dancers to move and investigate choreographic patterns. Historically speaking, it is difficult to trace a clear path connecting flamenco to kathak, but, according to some, gypsies left India and travelled through the Middle-East and Europe until some of them arrived in Spain. In this sense, a beautiful film documentary comes to mind, Tony Gatlif’s Lacho Drom (1993) where there is very little dialogue as the main role is played by the rhythm of music and dancing. Khan, photo Jean Louis Fernandez. As it often happens, we find out that what or who we considered to be the Other is much more similar to us than we thought, it is an animal we may like, a person we become fond of. In Torobaka two types of gestures remained in my mind recalling me that, the joined hands both Galván and Khan recurrently perform pointing them downward towards the floor/earth from which so much of their energetic rhythm comes, and their hugging and touching which testify to their artistic bond. 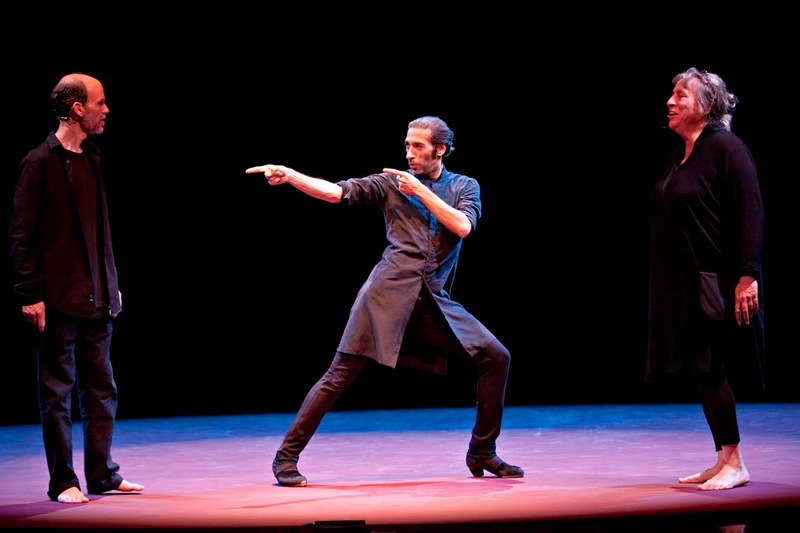 According to Galván one has to kill the audience before the audience kills you, that is his peculiar motto which testifies to the violent, aggressive element inherent in flamenco, while to Khan dance is like an offer, a gift one donates to the audience, as the cow donates milk to the world in Hindu religion. Again the bull and the cow, violence and peace, and in Torobaka dance is definitely a gift so exquisite it can virtually kill.